If you’ve been following my SCED project, you may have seen these designs turn up gradually as I was working on them, but they are all finally finished now! 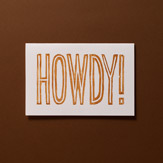 The Howdy design was actually one of the first linocuts I did, but it’s such a nice simple design that really came together along with the envelope lining I designed to go with it. The Ahoy There! 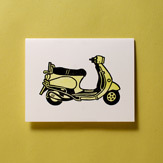 design is set in real Cooper Black metal type as well as the linocut, and the Pistachio Vespa design is a two-colour press, so they’re all pretty special. 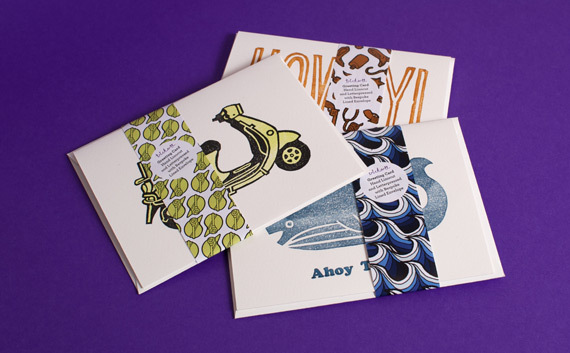 The cards are made of 300gsm Somerset paper, which is a nice thick stock made of 100% cotton. They come with envelopes made from 120gsm Rives artist paper, lined with a laser-printed bespoke pattern to match the card. Luxury! Making these cards the old-fashioned way is a pretty drawn-out process. Aside from coming up with the actual designs and linocutting them, I made the above video, showing most of the process of manufacturing these cards, edited down to two-and-a-half minutes. It should give you a pretty good idea of what went into the creation of them! I am selling the cards for £2.50 each, including the luxuriously lined envelope. If you like all of the designs and can’t decide which you like best, I am also selling them as a multipack containing one of each design, for a modest discount. 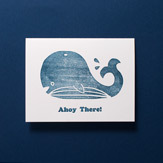 The cards will be sent via Royal Mail first class if you are in the UK, or airmail if you are overseas. They will be posted in an external brown envelope with cardboard stiffener to make sure they arrive shipshape. So if you like them, head on over to my new shop now, and don’t forget to check out the canvas and poster prints I have for sale too!